Awhile back I posted some progress images of a fireplace concept for some new clients. I am embarrassed to just now be introducing. Although we are nearing the end of the project, I wanted to do a proper introduction, give some insight into the client’s style and show some fun before and progress photos. Martin, an environmental lawyer and Norma, who’s job is raising three boys, two young boys and Martin. :] Martin called me amidst our relocation back to San Francisco, interested in hiring an interior designer. The architectural drawings were drawn (hand drawn if you can believe it), but they were looking to hire an interior designer to help with finish selections, cabinet designs, redesign of the fireplace, as well as a slight redesign of the master bathroom layout, and all the other fun details. My initial interview I was sold on the project. Who wouldn’t want to design a midcentury rancher in Berkley Hills with two of the nicest people ever, who had a sense of style and a dream to be in DWELL magazine. Needless to say, we immediately formed a bond. Side Note: The interview occured the same morning as Endeavors Historic Flight over San Francisco's Golden Gate. I was able to view it first hand from Martin and Norma's panoramic backyard view of the bay. It was a a great wat to start off an interview! The project was a bit fast tracked. We started mid October 2012 and had the entire house designed by early December. Construction began November 1st, 2012. Martin and Norma were born and raised in and around Berkeley, CA. The home they purchased is located in Berkeley Hills (Kensington) and the backyard boasts of the view of the San Francisco Bay. You can see all three bridges from the backyard, an utterly breathtaking view. The below photo doesn't do the view justice. Wants & Needs: To open up the house, downplay the awkward architectural elements, re-use as much flooring as possible, reuse building materials as much as possible, select eco friendly materials and provide a kid friendly yet classic, rustic modern environment to raise their family. Martin’s and Norma’s style: Kid friendly, playful, rustic yet modern. Martin’s environmental background and Norma’s ranch life was well suited for natural organic finishes. Norma’s love for horses, due to her jockey father, grew up around horses, leather and the refined society of racing. I was bursting with excitement inside when Norma told me her love for horses. As most of you know, I too rode as a child and am a horse lover. To design a mid-century rancher home for another lover of horses has been a dream of mine. I was thrilled. I was yet again blessed with great clients. The family moved in roughly 3 weeks ago. Next steps: Finalizing Furnishings, Accessories and Styling! I am so excited to add Martin and Norma to our list of extended family members. You can check out more progress photos here, and be sure to follow us on Instagram and Facebook for more daily progress project photos. Things are finally getting a bit more organized in our world since our move back to SF, I can't believe it's been a year! Back soon with a few more project introductions! Stay tuned!! At last...photos of my latest project! I can't tell you how thrilled I am at how well this project turned out. It will be the inspiration to my new home remodel for sure! It was a crazy deadline (due to a baby in utero), yet it was one of the most fun projects to work on thanks to the AMAZING team: Heather (home owner), Mason Miller (Architect), and John Fannon (contractor). You all will be missed! I really do hope I get a chance to work with all three of you again. You all were the best. This is as good as it gets. Photography by Odessa of Photo Designs by Odessa. She's amazing! We hired Odessa two days prior to the shoot. Thanks again Odessa! With Heather's due date and my across country move date set for September 27th, the team decided 3 days prior that we should try to get the shoot done before the baby arrived. I had a day and a half to set up/shop for the shoot. Schedule Shoot Date: Monday, September 26th. Larkin Louise arrived on her due date and I flew my kids (with Gigi's help) to Austin the 27th, the following day. Whew, we made it just in time! Let's just say, Jace wasn't too happy being left with unpacked boxes while I enjoyed my day at a photo shoot. I still owe him, HUGE. So, what do you all think? Rustic, Modern, Retro? Does this style work for you?! It definitely does for me. You can check out more photos here and on Mason's website here. Happy Wednesday! Tomorrow is the 10th which means my client is moving in! 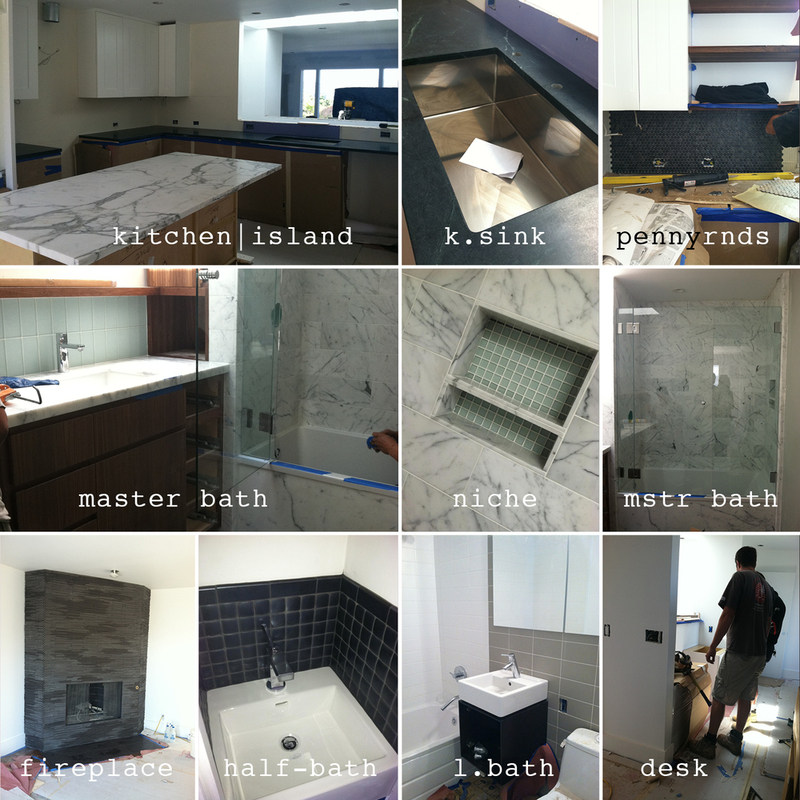 Here's a few snap shots of what the house looked like today. Carpet installs tomorrow morning and then the big move. There is still lots to do, but I'm sure we are on schedule. Can't wait to show you final photos. I am super excited to finally share with you some progress photos of the Noe Valley Mid-Century home that has consumed the majority of my design time these days! First off, my client is pregnant and decisive. Don't believe me? I was hired on June 16th to pick out the entire finish package for this remodel: tile, counters, cabinets, paint, flooring, plumbing fixtures, lighting, hardware and bathroom accessories for the 3/2 remodel. Everything is purchased and has arrived and is waiting to be installed. We even managed to get window treatments in by the time she moves in. Move-in Date: September 10th, three weeks from today...and she is supposed to have her baby girl two weeks later. ;) I guess you have to be decisive when a baby is on the way! I had to share photos of the Waterworks and AnnSacks boxes, two of my favorite places to shop for decorative and suprisingly affordable tile. I can't wait to show you what is in them! Island pendants, pennyround tile, glass tile, and statuary marble tile. Additional finishes include: a custom red lacquer desk, custom navy slatted island with calcutta oro counter, white shaker perimeter cabinets with soapstone counters, splashes of walnut, rockymountain hardware inspired pulls, and a groutless fireplace tile. Needless to say, it has been an absolutely amazing and fun project. The team: architect Mason Miller, owner of Mason Miller Architecture (the one responsible for the amazing transformation of the home) and contractor John Fannon, owner of Green Home Construction, have been a delight to work with on this project. I would highly suggest using them if you are a home owner interested in a mid-century modern or modern remodel, and are on a tight deadline. Very professional and even keyed guys, exactly what you want for a tight schedule. Next steps: Installing cabinets, setting counters, building the custom island, tiling, and installing carpet and baseboards. Exciting!! Stay tuned for more progress photos. Can't wait!